WASHINGTON (AP) -- Andy Roddick will be probably be avoiding the drive thru this week. But Roddick says he started feeling better several hours after that loss, and proclaimed himself ready to play Tomas Zib on Tuesday in the second round at the Legg Mason Tennis Classic, a tournament Roddick has won twice. "I'm getting better, should be all right by tomorrow,'' said Roddick, who added he never seriously considered not playing this week. 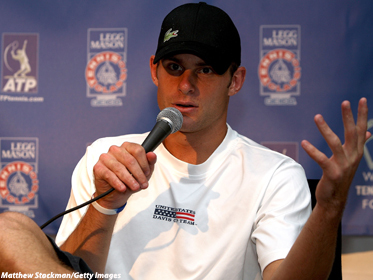 Roddick's brother and traveling coach, John, agreed. Roddick said there are others things to worry about, and he insists the surprising loss to Dancevic isn't one of them because the two didn't play when Roddick was at full strength. Heading into that match, Roddick only lost one set in his first three matches in Indianapolis. On the court Monday, Thomas Johansson of Sweden advanced to the second round by beating Colombian teenager Santiago Giraldo 7-6 (7), 6-7 (5), 6-4. The match began Sunday, when rain postponed play with Giraldo serving while trailing 6-5. Johansson, who won the Australian Open in 2002, had plenty of chances to get to the second round more quickly than he did. He nearly squandered a 5-2 lead in the first-set tiebreaker, led 4-1 in the second-set tiebreaker before losing six of the final seven points and was broken while serving with a 4-2 lead in the third set. After Giraldo held to get the third set to 4-all, Johansson won four straight points on his serve and ended the match in the next game when he belted a backhand winner up the line. Johansson will play defending champion and No. 4 seed Arnaud Clement in the second round. Igor Kunitsyn needed almost three hours to defeat Frenchman Sebastien Grosjean 6-7 (3), 6-4, 6-3. In the final set, Kunitsyn let an early lead get away, but the Russian broke Grosjean late to take a 5-3 lead and then served out the match. Jan Hernych also advanced to the second round after Nathan Healey retired at 1-all in the second set. Hernych, who had won the first set 6-3, will play No. 3 seed Marat Safin on Tuesday. In other first round play, Martin Klizan of Slovakia beat Konstantinos Economidis of Greece 6-4, 6-3; Paul Capdeville beat Ilia Bozoljac 4-6, 6-3, 6-0; Evgeny Korolev defeated Ricardo Mello 6-4, 6-4; Robin Haase of the Netherlands beat Alex Bogdanovic 6-4, 6-2 and Colombia's Allejandro Falla beat American Robert Kendrick 3-6, 6-2, 7-5.